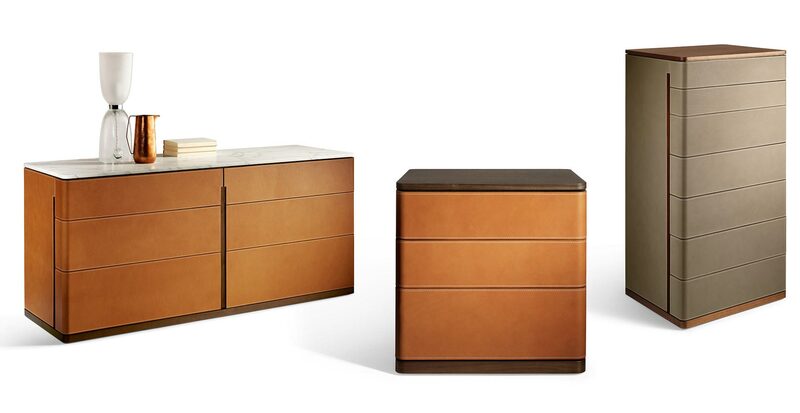 A collection of storage units for any room in the home. Low cabinet for the living room. Chest of drawers, tall boy and bedside table for the bedroom. Deliberately lean design, precious materials. Functional details become highly characteristic aesthetic elements, such as the recessed handles that provide interesting graphics on the surfaces. 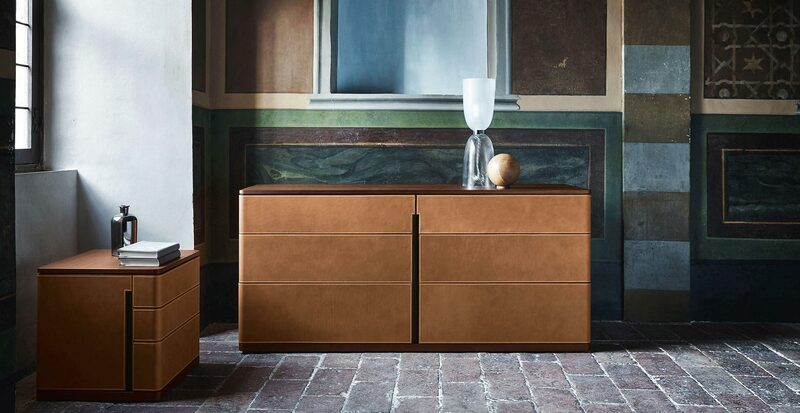 Intense contrast also between the dark, warm hues of Cuoio Saddle Extra leather and the wood covering the outside and the bight explosion of the very pale natural maple used inside the compartments and drawers. Formal minimalism and sophisticated finishes for an across-the-board collection, an easy match for all the Poltrona Frau furnishings yet with its own very defined personality. The low cabinet has a supporting frame in solid ash and birch plywood with moka coloured ash veneer. The system of compartments and drawers creates an alternating balance of empty and solid. The unit stands on a solid ash easel structure emphasising its visual lightness, perfect for living areas.The Fidelio bedroom units are more compact, to provide all the storage space needed in this room. The supporting frame is in solid Canaletto walnut and birch plywood with Canaletto walnut veneer. 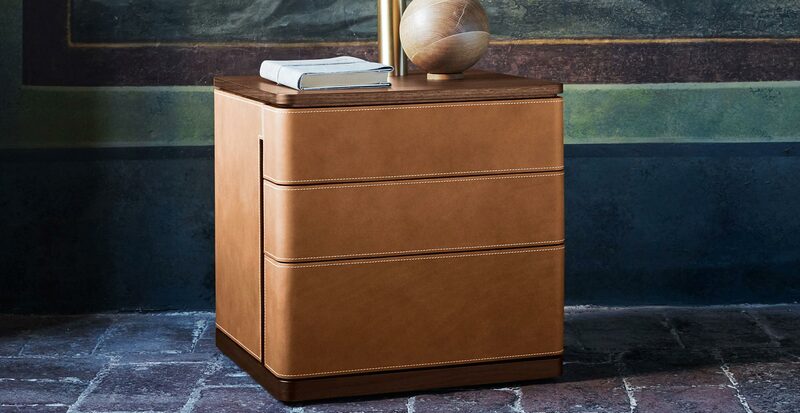 All the pieces in the collection have the outside of the drawers and side panels covered in Cuoio Saddle or Cuoio Saddle Extra leather. On request, the back panel can also be covered in leather, otherwise it comes in moka ash or Canaletto walnut veneer. An even richer impression of solidity is given by the versions with semi-polished Calacatta gold marble top for the bedroom units, plus a polished finished for the low cabinet. Alternatively, top in solid wood with moka coloured ash veneer for the low cabinet or in Canaletto walnut for the bedroom units.